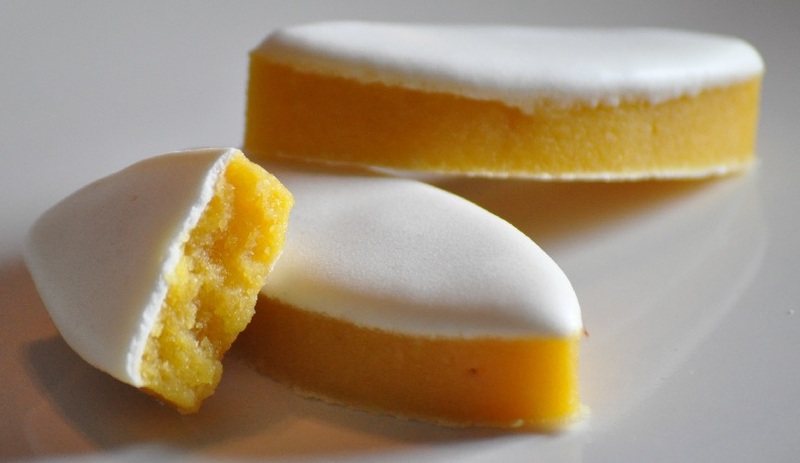 Calissons: Calissons are a traditional French candy consisting of a smooth, pale yellow, homogeneous paste of candied fruit (especially melons and oranges) and ground almonds topped with a thin layer of royal icing. Calissons have a texture not unlike that of marzipan, but with a fruitier, distinctly melon-like flavor. Calissons are often almond-shaped and are typically about two inches in length. Ideally calissons are oval shaped (like almonds) but you can cut them into whatever shape you like. Add the candied fruits and orange blossom water to a food processor and process to combine. Add in the almond meal and honey and pulse to incorporate in a homogenous mixture. Heat the saucepan on medium heat. Combine the superfine sugar and water and cook over medium-high heat until the syrup registers 250° F on a candy thermometer. Pour the hot sugar syrup into the food processor and process for about 2 minutes, until the mixture forms a smooth paste. Turn the paste out onto the sheet of wafer paper. Cover with a sheet of parchment paper and then roll out the paste with a rolling pin to a thickness of 1/2 inch. Remove the parchment and allow the paste to dry overnight at room temperature. In a medium bowl, whisk together the egg white and confectioners’ sugar until opaque and shiny. The royal icing should be light, fluffy, and slightly stiff. If too thin, add more confectioners’ sugar; if too thick, add more egg white to achieve the correct consistency. Use an offset spatula to spread a 1/16-inch thick layer of Royal Icing on top of the rolled almond paste. Place this in the freezer uncovered until the Royal Icing sets, takes about 30 minutes. Use a sharp chef’s knife coated with vegetable cooking spray to cut the Caillison into desired shapes. Calissons are ready to be served. Calissons are most often served after dessert. Calissons can be stored in an airtight container for up to 1 month. If you have any queries regarding the Calissons recipe, please leave a comment.